I was very pleased to find this Candlemaking Starter Kit by House of Crafts in a charity shop for £2.99. As I've mentioned before, I often look for candle making sets in charity shops because it can work out a lot cheaper than buying wax, wicks and moulds new. The recommended retail price for the kit is about £13, so that was quite a saving. 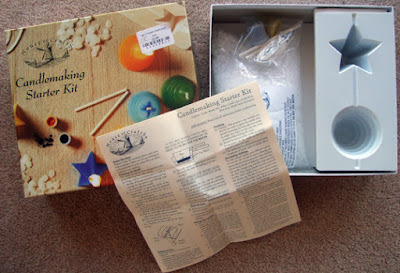 As you can see in the photo above, the box contains a bag of wax pellets, two small pots of dye, two moulds, wick rods, wick sealer and instructions. Making candles in moulds is relatively easy. You tie one end of the wick to a little rod then thread the other end of the wick through a hole in the bottom of the mould (which will end up being the top of the candle), using the wick sealant to hold it in place and stop melted wax dripping out. Then you balance your mould in a stand - this kit has a cardboard stand - and pour in melted wax. You sometimes need to top up the wax in the mould after it has started to set, but otherwise just leave it to cool and solidify before removing your candle. The instructions with this kit include ways of decorating candles, such as softening a patch of wax with the back of a heated spoon, pressing in dried flowers, then painting a little melted wax over the top of the flowers or dipping the entire candle either into melted wax or hot water to glaze it. If you do candle magic, then it is great to use candles you have made yourself, and kits like this are an ideal way to start. You can obviously then make them whatever colour you like - wax crayons can be melted into the wax if you don't have a proper dye of the colour you want.